This Cooked Vegetable and Egg Salad is a traditional Polish Holiday Salad and we have it for every holiday – Christmas and Easter, alike. It is mild and delicious and adaptable to eat with whatever you please! Enjoy! I hope you aren’t sick of my traditional Polish recipes because I have another one for you. It’s the last one from our Christmas Eve dinner. I know it’s late for Christmas recipes. Forgive me, haha. 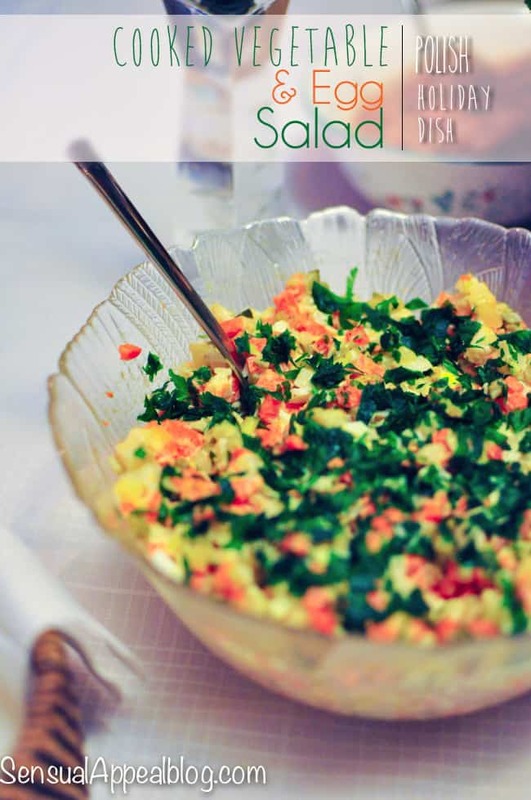 This cooked vegetable and egg salad is a traditional Polish holiday salad. It is my mom’s recipe so naturally that means it’s already healthier than the typical traditional Polish recipes. I got my healthy eating from my mom. Gotta love it! This cooked vegetable egg salad makes an appearance on our family dinner table twice a year – every Christmas and every Easter. We love it. My dad especially, he is always the one to initiate that we should make it. So maybe that makes the recipe just as much my dad’s as it is my mom’s. Let’s just say it’s a family recipe, that probably sums it up much better. This recipe makes one huge bowl. It’s huge. Like a whole lot of servings of salad. That’s why we make it for the holidays. It’s a special occasion. Going through all the labor intensive work of cutting and peeling cooked vegetables isn’t exactly my definition of fun, although it goes much faster when you have someone else helping you and doing it with you. The atmosphere automatically becomes much more cheerful and bright. I always make it with my dad while my mom prepares other dishes holiday dishes. 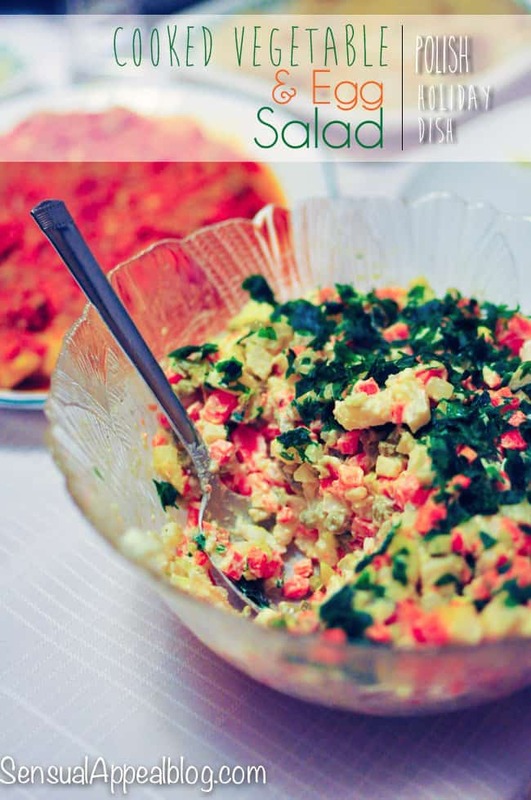 So get your family together and make this cooked vegetable and egg salad! Interested in more traditional polish holiday dish recipes? 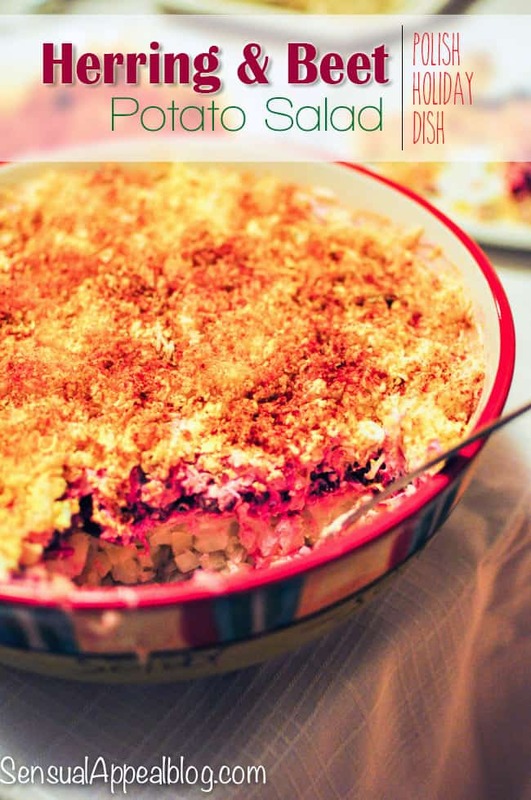 Make sure to check out the Herring and Beet Potato Salad – it is my favorite! Do you like egg salads? What’s your favorite cooked vegetable to put in a salad? This is my absolute favorite Polish holiday dish, and the fact that it only shows up around Easter and Christmas makes it all the more special. There are sooo many different variations to this, but our families’ recipe seems to be pretty simple. We always add apples to ours though. Apples huh, that sounds great, I haven’t tried it with apples but maybe I’ll request we add it when Easter comes around 🙂 Thanks for the tip! This looks good! I showed my Husband and he wants me to make it for him! I guess I’ll be making your dish this weekend!!! i will never get tired of your Polish food. I love being exposed to new food ideas – I’m always inspired! Hi Im from Czech and i have to say that i quite surprised me that we have the same salad for X-mas too! I knwo that we are s neighbours but still! 🙂 Looks yummy! Oh that’s awesome! Good to know 🙂 Thanks for stopping by!